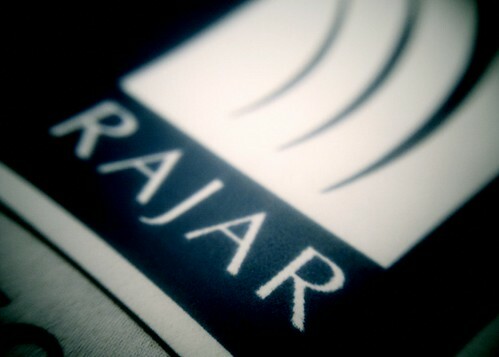 New RAJAR brings with it some big digital changes this quarter. This chart shows that digital listening has pushed through to 28.2% which is up a decent amount from the previous 26.9%. We usually get the big digital jumps in Q1 each year, when people start turning on their DAB radios after Christmas, but is this the start of something a bit more? It’s too early to say. But we’re moving closer to one third of listening being digital. Digital reach has also grown by a decent amount, and we’re up to 48.4% of all listener using digital as some part of their platform mix.That’s a number that’s going to push over 50% within the next year I’d imagine. One number to look at is the internet listening number. There were a few people who noted that internet listening had fallen last quarter and wondered what it meant. I argued that it meant absolutely nothing and that like one of those annoying financial qualifiers, numbers can go down as well as up – especially within the margin of error. So this quarter, the number rose to 3.7% – an all time internet listening high. Of the actual number, we should be wary. As ever, it’s overall trends we need to watch. And in this instance, the trend is clearly upwards. The differences between different stations’ levels of digital penetration remain starkly different. So Radio 1 is still well below the BBC’s average for digital listening – although it’s internet listening is ahead of average. DAB is where it’s let down, and historically DAB has been more popular amongst a slightly older audience. On the other hand Radio 3 and Five Live soar ahead of other BBC national services. Absolute Radio does really again (and is now up to a massive 69% of all network listening now being digital), while Talksport’s digital listening has actually dipped a bit this quarter. Among the big station groups you have standouts like Gold which is broadcast in various parts of the country on AM, but has just short of half its listening on digital now (with DAB being the main platform). Whereas strong FM brands like Capital and Heart are well below the average. That said, Capital has a significant internet listening figure, while Heart seems to be preferred on DAB – again reflecting those stations’ relative ages. I see that Matt has also highlighted digital, and looked at relative group differences by platform. One final digital statistic – 3.3m people only listen to the radio via a digital platform! Otherwise, what else is there to say? Well there are the usual ups and downs. The BBC has gained a little back on share, after commercial radio had such a good Quarter 2. The BBC now has a 54.5% shared compared with commercial radio’s 43.3%. That said, Global, Bauer and GMG all saw gains in hours. The latter, in particular did well, while Absolute Radio, Orion and UTV all lost share (not surprising in our own case since the number grew so much last time, it had to come down this time – it’s RAJAR law). Radio 1 and Radio 2 did especially well amongst the BBC’s services. I think Radio 3 will be disappointed with its fall though – particularly set against the Proms season which makes up much of the quarter. A relatively “light” summer for sport saw both Five Live and Talksport take hits, while Classic FM also fell a bit. There was the usual jostling for positions in London, with Capital and Heart both being able to say that they’re number one in London with Capital being the largest in reach (and doing especially well at breakfast), while Heart does best in hours. The losers are probably Bauer’s Magic and Kiss, which see a few falls. However London’s always “vibrant” in RAJAR terms, so it’ll be interesting to see if those leads are maintained. Capital, in particular, had their Summertime Ball in this period, and a massive TV campaign coming off the back of it. The BBC’s digital services tended to do modestly, will Radio 4 Extra’s stellar “debut” numbers under its new name, falling back a bit in reach, but growing in hours. And I’d be remiss if I didn’t mention Absolute 80’s excellent performance. It’s now bigger than many much older digital services like Planet Rock and 1 Xtra. Indeed, with over 1m listeners for the first time, it’s hot on the heels of 6 Music! Some of you will be pleased to see that I’ve updated my big interactive RAJAR Chart. Go and play with it here. Maximise the screen, and read the notes I wrote about it before explaining its shortcomings and weaknesses. A technical note worth mentioning is that this is the first quarter in which there’s been some digital diary measurement. At the moment it’s a relatively small amount, and RAJAR isn’t breaking the percentage out. All the numbers are available on the RAJAR website – click on the Quarterly Summary. Read about Absolute Radio’s performance here. Paul Easton has a piece on London here. And Nik Goodman has some thoughts here. Source: RAJAR/Ipsos-MORI/RSMB, period ending September 2011, adults 15+.